How many times have you watched and listened to very young children singing (to the tune of Twinkle, Twinkle Little Star) "A, B, C, D, E, F, G - , H, I, J, K, LMNOP..." So goes the alphabet song as little children realize they are singing something significant - a sort of rite of passage - as they know very well that they are preparing to enter the BIG ADULT WORLD OF LEARNING TO READ. As piano teachers, have you witnessed your students approach notereading with such unbounded enthusiasm? I have! I have watched young students with glowing eyes enthusiastically read and play on the keyboard (without prompting!) the new set of notes they are about to study--with the excitement of independent discovery as they see the logic and simplicity of seamlessly adding new notes to those already learned. In my new piano method, Piano ABC's, students learn to identify, read, write, and locate on the keyboard each new note alphabetically before playing it in a piece. Because fingerings are varied from the beginning and throughout, students never associate any finger on either hand with any particular note/key. In my own teaching, I encourage reading the notes in a piece rhythmically before playing the piece. Reverse alphabetical thinking is also emphasized throughout so students can read descending scale passages fluently. Using the visual and alphabetical center D as a checkpoint, students actually learn to identify all of the white keys on the piano keyboard in the very first lesson. In Level One of Piano ABC's, we study the middle set of seven notes/keys: A B C D E F G. Original compositions followed by note/duration check-ups first reinforce the notes A B C, then A B C D, then A B C D E, and so forth. Correct rhythmic conceptualization is facilitated through tapping rhythmically while reciting memorized instructive chants (for instance, "Half-note, two-counts" or "Whole-note-four-counts, one-two-three-four" spoken very evenly, "like a robot"). Conducting conveys intellectually and physically the sense of meter and of even pulse. Students become a metronome unto themselves through learning (1) to conduct as they count the beats, (2) to conduct as the teacher plays, (3) to play as the teacher conducts, and (4) [in Level Two] to conduct as they count while tapping rhythmically. Additionally, graphic proportional illustrations help students acquire a profound grasp of rhythmic proportions. 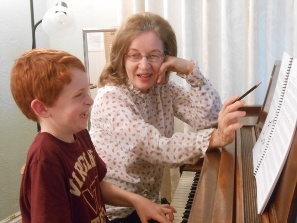 As they have been learning piano through the Piano ABC's method, it has been extraordinarily rewarding to watch students confidently and accurately read notes and rhythms as they learn their new pieces, and to commend many students from my own studio or from other teachers who "confess" with a self-satisfied grin that they have independently worked ahead to learn new pieces before they were assigned. Piano ABC's breaks new ground in several instructional categories differing markedly from other current methods as well as those of the past hundred years. I would be honored if you were to venture into fresh pedagogical territory by choosing Piano ABC's which has been endorsed by some of the major pedagogues in this country as an original, innovative, student-friendly, and unique 21st Century approach for beginning pianists.